An eerie new video has emerged, showing an earthflow creeping its way across a landscape in Russia, levelling everything in its path. It's like a tsunami — but one comprised of snow, rocks, and mud. The four-minute video shows the earthflow as it crunches trees and powerlines. You can actually hear the sounds of the trees snapping. Gotta say, the guys filming the video seem remarkably calm about the whole thing as they slowly inch back along the road. As reported by the American Geophysical Union's Landslide Blog, very little is known about the incident, except that it happened on April 1st, 2015 at Zarechnyi, which is in western Russia. 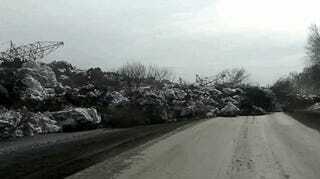 It's currently the thawing season, so the conditions are right for this type of landslide. Earthflows happen when ground materials like fine sand, clay, and silt become saturated with so much water that the earth becomes viscous. When these conditions arise on a slope, the downward pull of gravity instigates a flowing action. The speed of the earthflow depends on the degree of water saturation and the angle of the slope. It can take years — or in this case, minutes — for the materials to move down the slope.